Dimensions 6.10 by 8.90 by 1.40 in. Amazon.com description: Product Description: Well-known technology executive and angel investor Elad Gil has worked with high growth tech companies like Airbnb, Twitter, Google, Instacart, Coinbase, Stripe, and Square as they've grown from small companies into global brands. Across all of these break-out companies, a set of common patterns has evolved into a repeatable playbook that Gil has codified in High Growth Handbook. 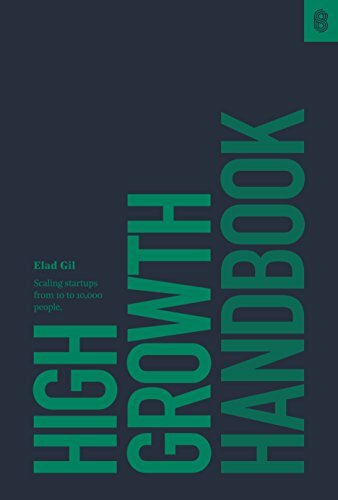 "Armed with observations gathered scaling some of the most successful and important companies of Silicon Valley, Elad has no-nonsense, highly applicable advice to any operator transitioning a company from the proverbial garage to the next stage and beyond." "Elad is one of the most experienced operators in Silicon Valley having seen numerous companies hit their inflection point. His advice has been key for Coinbase as we go through hypergrowth, from hiring executives to improving M&A." "Elad is one of the best connected and respected early stage investors in the Valley - he invested in Minted when we had fewer than 50 employees and his advice was critical to us in growing our business to where we are now, in the low hundreds of millions in sales. In his book, he crystallizes all of these learnings for the next generation of companies."